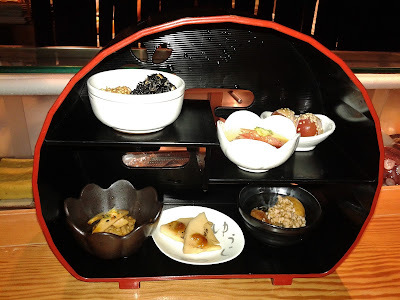 After the midterms season ended, I immediately felt the need to go for an omakase dinner, a special dining experience in which the selection of dishes is left up to the chef. 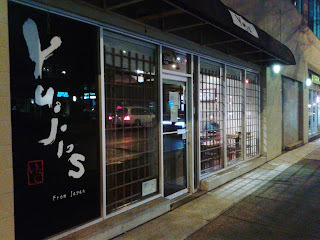 I've heard many good things about Yuji's from Japan, but what really made their omakase attractive to me was the fact that it was for $50. For only $50, I could forget all about how I did on my midterms. An excellent deal, I would say. 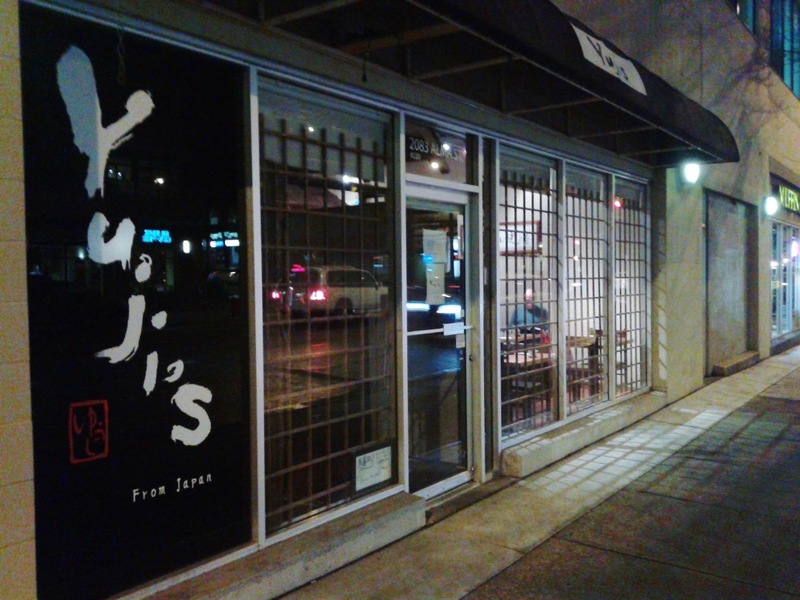 I visited the restaurant on Chef Yuji's first day back from his trip to Japan, and during my visit, the restaurant was already bustling with activity. Things were off to a good start as the servers were very friendly, and the quality of the green tea was excellent. However, trying to be discreet with my note-taking was an epic fail as the dishes were highly creative, which meant that I had to ask one of the servers to repeat the descriptions for many of the dishes I was served. I am very grateful for his patience. First to arrive was a tower of six appetizers. While I was awed by the presentation, what amazed me more was how this was brought to me intact. If I were the server, the result would most likely be a disappointed (and possibly angry) Chef Yuji staring at his creations lying on the floor in a splat. 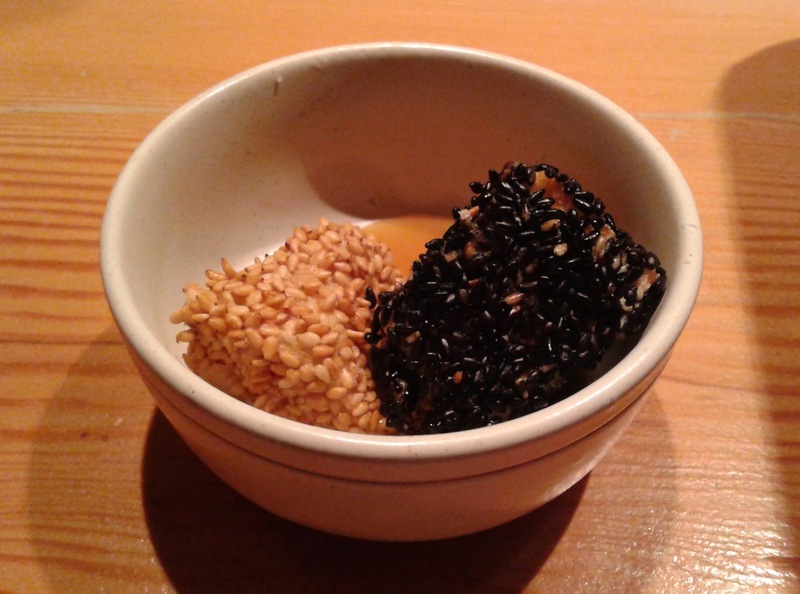 The first appetizer I tried, the Sesame-Covered Eggplant, was a success. With a juicy piece of eggplant in the center and a crunchy, aromatic layer of sesame seeds on the outside, this was a delightful start to the omakase. I was very impressed with the second appetizer, which featured silky, soft snow crab and a refreshing egg custard. The amount of wasabi was just right and went surprisingly well with the custard, giving it a unique, spicy kick. The Cherry Tomato Gomaae came with two extremely juicy cherry tomatoes. 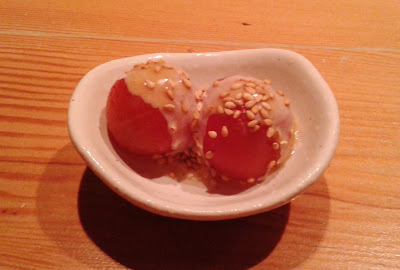 The sesame sauce was decent but not really absorbed by the cherry tomatoes. The Chicken Tsukune was solid as the meatball was comprised of tender chicken meat that absorbed the light teriyaki sauce perfectly. 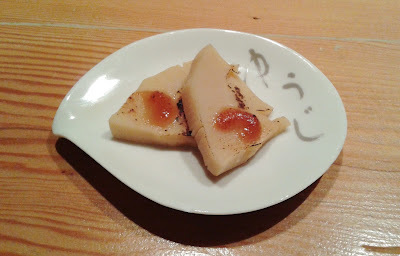 There was nothing mindblowing about this one, but the miso glaze on each piece added a nice sweetness. The bamboo shoot was not too chewy and had sufficient moisture. 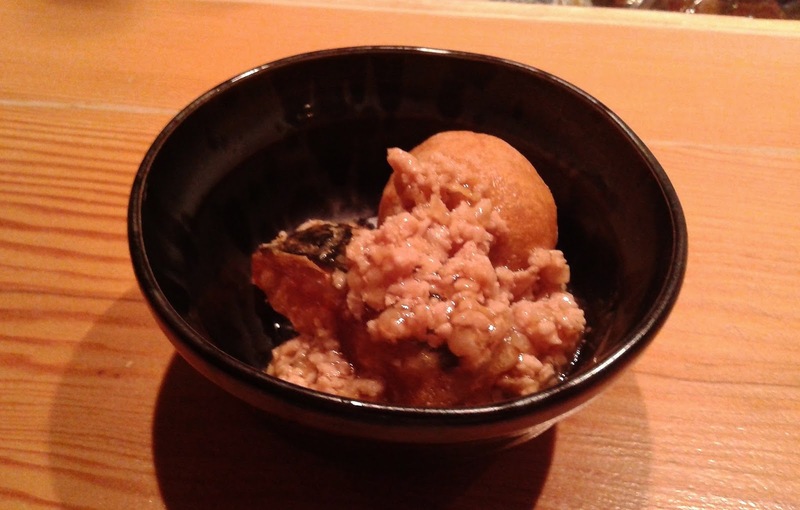 I love miso-infused taro, and they nailed it here! The squash was by far the juiciest and softest piece of squash I have ever had. This definitely tasted much better than it looked. After the appetizers, I was presented with two more resounding hits. 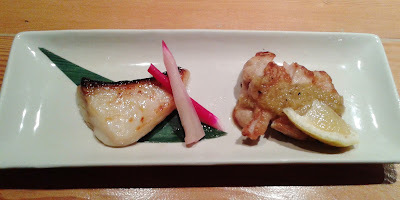 The Miso-Marinated Sablefish was very juicy and silky, and I enjoyed the aromatic fish oils. The fish was so soft that it just melted in my mouth. I would have given it an A+ if it had a slightly stronger miso flavour. 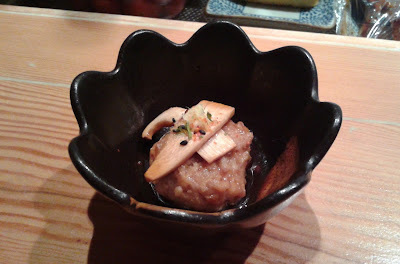 Moving to the right, I was highly impressed with the Shio-koji Chicken. It had a delicious pepper-like, smoky flavour and was very juicy and tender. The shio-koji and slice of lemon worked together to provide a slight zing. 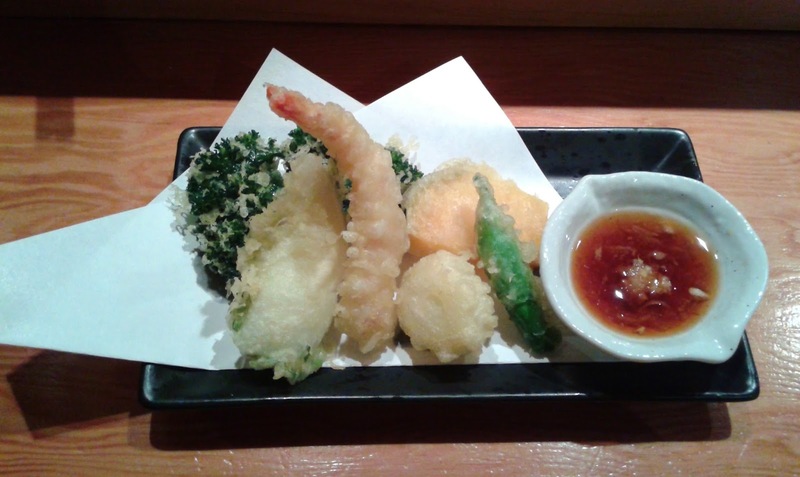 Next came a dish consisting of various tempura items. The batter was excellent and was appropriately thin, crispy, and savoury. The sweet chili pepper was not spicy and pleasantly juicy. The Cipollini onion had a nice balanced flavour but fell apart. Next, the kabocha was sliced thinly but was full of moisture. The prawn tempura was meaty with a good snap, and the ika (squid) with shiso had a refreshing minty flavour and a decent rebound. Finally, I was quite intrigued by the large piece of kale tempura at the back. It tasted almost exactly like a fluffy, airy version of vegetable chips (but of course, this tasted much better than standard vegetable chips). 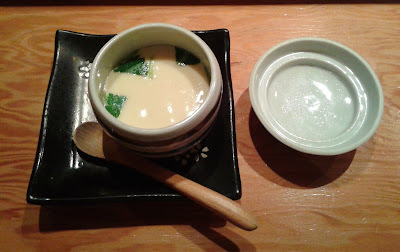 I'm not the biggest fan of eggs, which explains why I have never ordered a Chawanmushi before. However, this Chawanmushi transformed my brain from fearing chawanmushi to craving chawanmushi. The steaming egg custard was mixed with a tasty, heart-warming seafood broth and contained some cooked scallop, shrimp, tilapia, and spinach. I was very impressed with my omakase dinner so far, but the nigiri sushi was a blunder compared to everything that came before. There were just too many mistakes. The sushi rice tasted overcooked and was too hard texture-wise, while some pieces contained too much wasabi. 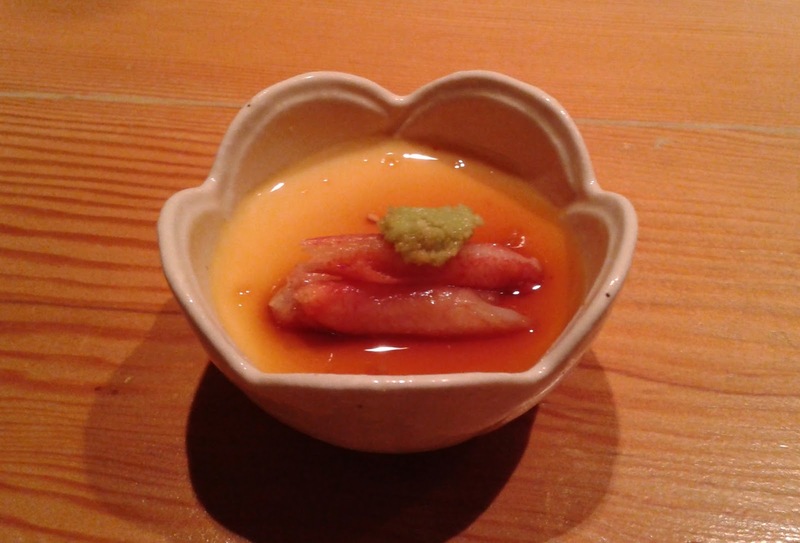 In addition, the sushi rice was too tightly packed in the Tai Nigiri. Was Chef Yuji still in vacation mode?? Well, at least it was still better than T&T Supermaket's sushi rice. Despite the subpar rice, the fish were very fresh. The bigeye tuna had a delicate, sweet flavour, while the hamachi was soft and creamy. 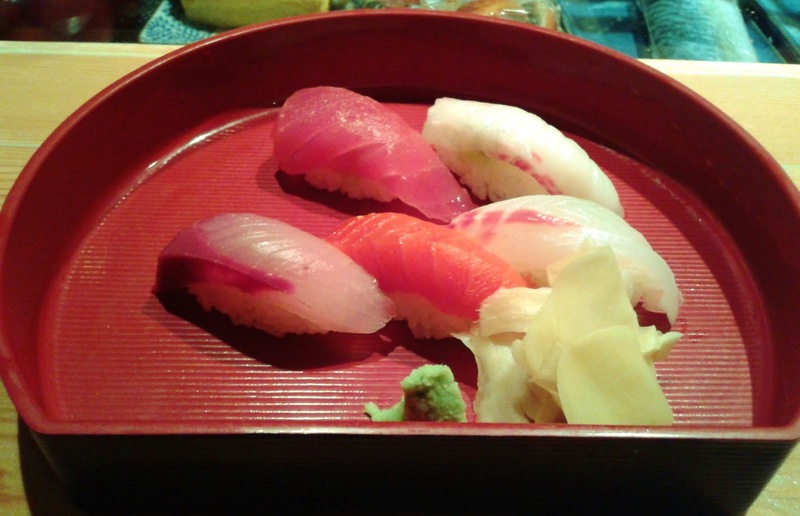 The yazu, a younger variant of hamachi, was slightly chewy, but the sockeye salmon had an appealing, smooth texture. The tai, being creamy, smooth, and not too chewy, was also a delight. 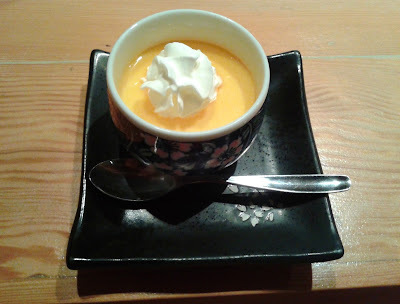 Thankfully, the omakase ended with a well-executed dessert, the Cream Caramel Custard Pudding. It was homemade and consisted of a vibrant blend of sweet flavours, accented by the melty layer of caramel on top. It was served at a cool temperature, which made it especially refreshing. The highly enjoyable and creative dishes were complemented by the friendly and attentive service, which lasted throughout my dinner. Despite the nigiri mishap, I still highly enjoyed my visit. For an omakase, I would have liked to see more high-ticket items, and I felt that $50 was slightly on the pricey side. That being said, Chef Yuji's creativity made up for the price premium. Hopefully, when I decide to make a repeat visit, I will be able to experience the masterfully crafted sushi described in the online reviews.